One of the most obvious reasons for the food industry to partner with sport is to help deflect blame for diet and weight related illnesses away from their products and onto inactivity. But there's another reason they get involved - to reach impressionable children (often younger than those they claim not to target) and create lasting emotional brand attachments. For instance a few months ago ParticipACTION offered up their sponsor Coca-Cola (yup, Coca-Cola is ParticipACTION's largest sponsor and to date has given them $10 million) the opportunity to send their brand ambassadors out to meet kids. It was called a "Teen Challenge" but looking at Coca-Cola's promotional video of the event (screengrab up above, video linked here), it would seem teens were not the predominant attendees. And in comes Coca-Cola branded Patrick Chan, a highly charismatic figure skating Olympic hero to brighten up their days. And here's Coca-Cola branded BMX Olympian biker Sarah Walker at a Let's Move 60 event. But it's not just smiles given out at these sorts of food industry sponsored charitable sport events. Here's an email from someone who wishes to remain nameless describing their recent trip to a Coca-Cola sponsored, Olympian attended, event. 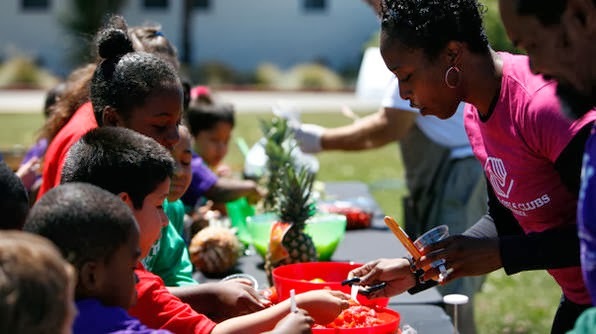 But before we get to their description, here's a photo from the Coca-Cola press corp that accompanied their headline, "Fruit and Veggie Fest Teaches Children About Healthy Living"
Looks and sounds great, right? Olympic athletes: One who is also a Coca-Cola executive and the other was Gale Devers, Olympic gold medalist. A thank you to Coca-Cola. The kids were engaged in an obstacle course, zumba, crafts, and fruit and veggie snack making tables. There were also 4 food trucks handing out tastings of vegetarian tacos and sandwiches. The kids were also served Dasani Water and neon-blue Powerade Zero. After a significant amount of eating, and a small amount of physical activity, the youth exited with bags of trinkets and water bottles, an 8-inch Subway sandwich, and more bottled Dasani and Powerade. The small crowd of black and latino children was very well documented by photographers and videographers. I am pretty sure the kids didn't leave the event with a message of “Eat and drink less.” I am sure there was atleast 1000 calories provided to each child in a 2 ½ hour period. In fact, I believe the message they existed with was stuff your face, and then some, and wash it down with Coke products was reinforced."